You probably notice this each Spring—just as flowers start to pop up, so do “for sale” signs. Spring is a very popular time to list houses. And that’s just the reason that you may want to list your home during the winter months. Listing a house now means less competition because there are fewer homes on the market for buyers to choose from. You may also see that buyers are more motivated this time of year—if they are upsizing or downsizing, they’ll likely wait until the warmer months when it’s more weather-convenient to get out and look at homes. Buyers this time of year often are relocating and need to find a home quickly. And let’s face it, people who are choosing to look at houses (and willingly leave their cozy couch) when it’s freezing outside are people who really want to find a new home. There are many other reasons that people are motivated to buy during this time of year: they may have received holiday bonuses, may be anticipating a big tax refund, or (after the yearly September baby boom) may realize they need more room for a growing family. Looking to sell your home? Don’t wait until Spring! 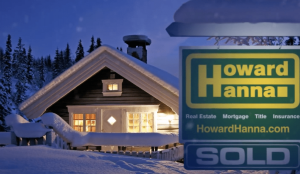 Contact us to learn about listing your home during the winter months. The fresh blanket of snow on your front lawn, combined with a big blue sky behind your home, can give your house more curb appeal than you’d ever imagined possible. PreviousWe’re in Pittsburgh Parent Magazine!